The eastern love of creating quasi-republics is nothing new. Various creations came into existence during revolutions and wars; they were a means to fill a void or were a result of accomplished policy. In 1917, the year that divided Russia into two periods, the Soviet Republic of Naissaar was created. Naissaar (“Nargo” in Swedish, “Nargen” in German) is a small island which currently belongs to independent Estonia, a 19-kilometre piece of land, situated less than ten kilometres from the capital city, Tallinn. The island guards the northwest part of Tallinn Bay. Adam of Bremen mentions “the island of women”, as it is translated from the Estonian language, in the chronicles Gesta Hammaburgensis ecclesiae pontificum (The Deeds of the Bishops of the Hamburg Church, 1073-1076) as “Terra Feminarum”. According to the legend mentioned by the chronicler, the island was inhabited by beautiful women (“when women are born (here), they are the most beautiful of all”) and cruel men, but in reality they were Swedish fishermen and seal-hunters. Arabic coins from the eighth to tenth centuries have been found on the island. In the middle of the nineteenth century almost two hundred settlers lived on the island, which at that time was divided into 34 farmsteads. In 1858, a small church was built, subjected to the Swedish parish of St. Michael in Tallinn, and in 1874 a school was opened. Even though the history of settlement on the islands began in the Middle Ages, from the eighteenth century onwards, the inhabitants were regularly forced to move from their homes for soldiers, for whom the island was a strategically important defence point. 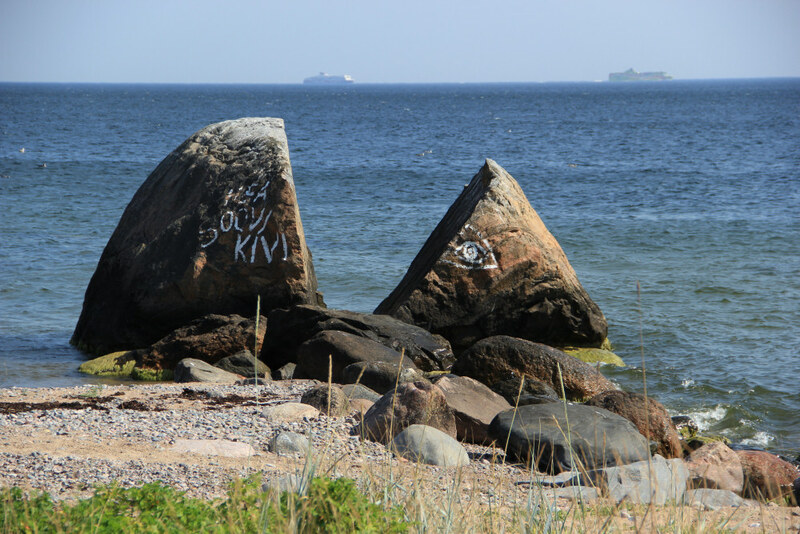 Sometimes it was the Swedes, who in 1705 built a small fortress here; sometimes the Tsarist empire, which built a system of nine bastions; and sometimes for the family of Soviet nations, which mined the island and mass-produced marine mines here. The military buildings on the island, which you can still admire today, were built by the Tsarist empire on the eve of the First World War. In 1907, the defence plans were confirmed, and the first builders arrived in 1913. In 1914, plans for the complete militarisation of the island were accepted, which meant the evacuation of the inhabitants. During that time, a harbour was built on the south coast, and to the north, a narrow-gauge railway was constructed. It was almost 38 kilometers long (and is the only working narrow-gauge railway in Estonia to this day). The system of fortifications was strengthened too – with bunkers and other defence installations. In July 1914, Tsar Nikolai II personally visited the island to place the cornerstone for a large military harbour. The Council quickly began creating a constitution. They chose the village of Lõunaküla for the capital city and “The Internationale” became the national anthem. The black and red banner of the anarcho-syndicalists became the flag of the new republic. They were also planning to issue a currency, but its name is unknown. The Soviet republic de facto recognised Estonia, at the time fighting for its own independence, but the Council treated both the Bolsheviks and the Germans as enemies of the island nation. The red-and-black republic did not last long. Its short existence was ceased on the 26th February, 1918 with the occupation of Estonian territory by the German Empire. Russian soldiers fled when the German army came to the island. The sailors first ran to Helsinki, and then to Kronstadt Island, where Petrichenko played a role in the uprising of 1921. The Soviet island republic had existed for just two months. In 1918, the retreating Russian army blew up the bunkers, the church and other buildings. In 1920, the island officially became a part of the young country of Estonia (in Tartu in February 1920, Estonia signed a peace treaty with the Russian Soviet Federative Socialist Republic). Peace enabled previous inhabitants to return to the island and helped its development – in 1934 the number of inhabitants increased to 450. The island became depopulated again during the Second World War and it remained a closed army base of the Soviet army all the way until the end of the Russian occupation in 1991. Many buildings come from this period, such as concrete defence installations, a casino, a sauna, a canteen, an electric power plant, barracks, family houses for officers (these came from Finnish war reparations, similar to the Finnish houses in the district of Jazdów, Warsaw) and a marine mines factory, surrounded by railway sidings. The centre of the island, with its military buildings, barracks and lighthouse in the northern part, is connected by the aforementioned narrow-gauge railway. The old agricultural and fishing buildings did not survive the Soviet period; the coast of the island is wild and varied, with gravel beaches and glacial erratics. In 1991, after Estonia regained its independence, the island became demilitarised again. In 1995 it became a nature reserve. Before it was opened to tourists in 1995, Estonia had to deal with more than 5,000 pieces of deadly weaponry (mostly mines). However, when visiting the island, it is worth remembering that probably not everything has been removed. Currently, two families live permanently on the island. What can you see on the island apart from the military buildings and the ruins of the marine mine factory? It is worth visiting the village of Männiku, where you can find the best-preserved examples of Soviet barracks, as well as lighthouses and a church from the interwar period (restored in recent years), a cemetery from the Crimean War and the remains of a garden that belonged to the Danish king Eric VI. You can reach the island by ferry from Tallinn. Current prices and schedules can be found on veeteed.com. This article originally appeared on Przegląd Bałtycki. Translated from Polish by Martyna Ostrowska.